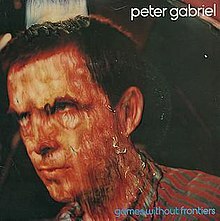 "Games Without Frontiers" is a song written and recorded by the English rock musician Peter Gabriel. It was released on his 1980 self-titled solo album and included backing vocals by Kate Bush. The song's lyrics are interpreted as a commentary on war and international diplomacy being like children's games. The single became Gabriel's first top-10 hit in the United Kingdom, peaking at No. 4, and – tied with 1986's "Sledgehammer" – his highest-charting song in the United Kingdom. It peaked at No. 7 in Canada, but only No. 48 in the United States. The B-side to the single was two tracks combined into one: "Start" and "I Don't Remember". The song's title refers to Jeux Sans Frontières, a long-running TV show broadcast in several European countries, in which teams of residents representing a town or city in one of the participating countries would compete in games of skill while frequently dressed in bizarre costumes. While some games were simple races, others allowed one team to obstruct another. The British version was titled It's a Knockout, which Gabriel mentions in the lyrics. The sentence construction and content of the lyrics "Adolf builds a bonfire/Enrico plays with it" are evocative of a passage from the diaries of Evelyn Waugh in which he wryly refers to his own children playing with fire. The song was Gabriel's first UK Top 10 as a solo artist. Gabriel's first two solo albums were distributed in the US by Atlantic Records, but they rejected his third album (which contained this track), telling Gabriel he was committing "commercial suicide". Atlantic dropped him but tried to buy the album back when "Games Without Frontiers" took off in the UK and started getting airplay in the US. At this point, Gabriel wanted nothing to do with Atlantic and let Mercury Records distribute the album in America. The track features Kate Bush on backing vocals. The whistling is performed by Gabriel, along with producers Steve Lillywhite and Hugh Padgham. The video includes film clips of Olympic events and scenes from the 1951 educational film Duck and Cover, which used a cartoon turtle to instruct US school children on what to do in case of nuclear attack. Such forlorn imagery tends to reinforce the song's antiwar theme. The album version of the song includes the line "Whistling tunes we piss on the goons in the jungle" after the second verse and before the second chorus. This was replaced for the single release with a more radio-friendly repeat of the line "Whistling tunes we're kissing baboons in the jungle" from the first chorus. The BBC also censored the video, resulting in two versions being released; one omitting the children seated around the table. Gabriel's 1991 performance of the song from the Netherlands was beamed via satellite to Wembley Stadium in England as part of "The Simple Truth" concert for Kurdish refugees. "Games Without Frontiers" was licensed as the title music for the Commodore 64, ZX Spectrum and Amstrad CPC computer game The Race Against Time, which in turn was the official game of the charity event Sport Aid '88. The Thirteenth Winter X Games introduced Gabriel's and Lord Jamar's remix of the song, redubbed "X Games Without Frontiers", which became the theme for subsequent games. The song is featured prominently over the closing montage of "The Colonel", the first season finale of the FX spy thriller series The Americans. ^ Huey, Steve. "Games Without Frontiers". AllMusic. Retrieved 3 October 2015. ^ "Peter Gabriel - Games Without Frontiers". ultratop.be. Retrieved 2012-01-06. ^ "Peter Gabriel". PeterGabriel.com. 1980-05-22. Retrieved 2016-10-16. ^ Gabriel, Peter. "Peter Gabriel – Games Without Frontiers - The official Games Without Frontiers video. (includes lyrics)". Retrieved 11 May 2014. ^ Kent, David (1993). Australian Chart Book 1970–1992 (illustrated ed.). St Ives, N.S.W. : Australian Chart Book. p. 120. ISBN 0-646-11917-6. ^ "Item Display - RPM - Library and Archives Canada". Collectionscanada.gc.ca. Retrieved 2016-10-16. ^ "The Irish Charts – Search Results – Games Without Frontiers". Irish Singles Chart. Retrieved June 16, 2018. ^ "Peter Gabriel Chart History (Hot 100)". Billboard. ^ "UK Singles of the Year" (PDF). Record Mirror. London: Spotlight Publications. December 27, 1980. p. 30. Retrieved June 13, 2016. ^ "The Race Against Time (1988, Code Masters)". YouTube. 2012-11-16. Retrieved 2016-10-16. ^ "Eventmedia". Espneventmedia.com. 2009-01-23. Retrieved 2012-01-06.